Everybody knows that it is getting more and more important to optimise mobile websites. The question for a lot of people is how to do it and why? Why is it important to optimise mobile websites? Way back in the early days of the web something happened to music. There was a niche music style called Indie. It had a raw honest feel to it and it steadily grew in popularity until in the end, it wasn’t a niche market, it was the market. Bands like Oasis and Blur became the top selling artists of their time, with singles hitting number 1 on the day of release and albums that scooped the top awards all over the world. You could go into a pub called The Mixer in Camden and enjoy a friendly pint with the bands who were about to play Top of the Pops later in the week. A very similar thing has happened to the internet audience. Once it was a niche but now anyone walking around can access it anywhere from their smartphone. Mobile now is the internet, and websites have to adjust to this to optimise the mobile experience. There are really two sides to this. The first is technical optimisation so that the site loads quickly, and the other is about usability to ensure that mobile users have an optimal mobile user experience. This is about looking at the code to ensure that the load time of a page across mobile connections is fast. We recently sat down with Google to discuss this and also what the points are to look for. This came down to three main issues. There are some interesting statistics that Google had from researching actual mobile usage of the web. 60% of mobile users expect mobile websites to load within 3 seconds. 75% of people will abandon a mobile website if it takes any longer than 5 seconds to load. Over 80% of all websites take longer than 5 seconds to load on a mobile browser. The last point is a sobering thought. It means that with a small amount of optimisation, websites could triple the number of user sessions on their site. Potentially this is huge levels of revenue that is vanishing before it has begun a session or completed delivery of the landing page. It is all well and good to watch your web page load onto your smartphone across a Wifi connection, but most mobile users are not connected to Wifi when they are browsing the web. They use 4G connections and in many areas outside of cities that could be 3G connection. That is the level that a web page should still achieve the 3 second target. Many companies that we talk to explain their user journey to us. Typically this begins with a mobile user who researches things online and then switches to a desktop device to purchase. This is great for users who have desktop and mobile devices but there is a much higher percentage who only use a mobile device. The truth is sites that do not offer an optimal mobile experience are missing out on revenue. Therefore providing a great experience to both desktop and mobile users makes perfect business sense. This long held view that mobile users do not buy online is a myth. The issue is that mobile users do not have the best experience. They are not comfortable enough to purchase. This is what we as an industry have to address. 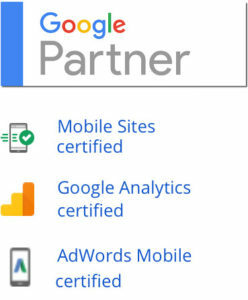 As part of our Google Partners Qualification we have received accreditation to optimise mobile websites. We do it by analysing the site. We test at 3G speeds and by applying best practice for the code of the site. That doesn’t make us unique but we are one of the few who have achieved every accreditation possible by Google and through that we have access to resources that many other agencies do not. It is our guarantee to our clients that we will deliver on our promise. Currently Google are promoting two advanced techniques to speed up delivery of web pages to mobile devices. They are not right in all situations and for some a responsive website design is the optimal choice. For others there are two additional options. Both of these optimise mobile websites and deliver faster pages that increase traffic. PWAs are in their infancy and are not supported on all mobile devices. Therefore their usage is limited. We are keeping a very careful eye on this situation and how it develops. AMPs create a second version of the page that loads very quickly. They are only delivered to mobile devices and a line of code in the main page tells Google to list the AMP page whenever a mobile device searches on their site. The impact of this is a fast and efficient mobile experience for users. We are happy to advise on which techniques businesses should use in order to optimise mobile websites, so please get in touch if this subject is of interest to you.